One of the first bits of parental advice I got after finding out I would be a dad was to get my child a balance bike as early as possible. Even though Alex was more than a year away from being big enough to ride it I pulled the trigger on a Strider bike. Other than some minimal playing around inside I knew we wouldn’t really get to use it until this Spring. At 2 and a half years old his running and motor skills are just at the point where he can start to get used to the bike, and today we had our first true outdoor session! For those who have never heard of a “balance bike” let me fill you in. Many of us learned to ride bikes using training wheels. These awkward wheels may actually slow a child’s ability to learn to balance on a bike… you are basically just relying on one crutch until you lean to far one way and now you are relying on the other crutch. Balance bikes have no training wheels. They also have no pedals. At first that seems odd, until you watch a toddler struggling to learn balance and the leg coordination to pedal correctly while trying not to bee-line it into the nearest tree. By removing the pedals a child can simply focus on learning to balance (and steer). Essentially they walk around until they feel comfortable sitting down and gliding. Today we headed to our neighborhood park for a true biking session. Alex’s best buddy Rowan joined him with his brand new Smart Gear balance bike. While there was no real “gliding” going on yet both kids enjoyed “riding” the bikes around the park for almost an hour! They took turns on each bike, and Rowan’s mommy and I started formulating a plan for weekly ride-play-dates. While I liked the eco-friendly nature of the Smart Gear bike, and the “anti-jackknife” feature, I think the boys liked the thinner profile of the Strider bike. It was easier for their little legs to stay under them on the narrower bike. This probably won’t be an issue once they both get a few inches taller. The Strider bike though also has foot rests which are definitely going to be needed once he starts gliding. While we were at the park multiple parents came over with their kids asking if they could let their little ones try. Alex & Rowan were happy to spend time on the slides & swings while their bikes were demo’d. I got the impression that many of the new parents didn’t realize they could start their young toddlers on a “real” bike at such a young age. At least one parent seemed like he was heading to a store to buy one right after leaving the park! There are some pretty amazing Strider videos out there. Check out Strider’s official YouTube channel here. How old were you or your kids when you starting riding? Did you use training wheels? Any tips for other parents? The weather the last few weeks has been perfect for getting outside and enjoying the transition to Fall. 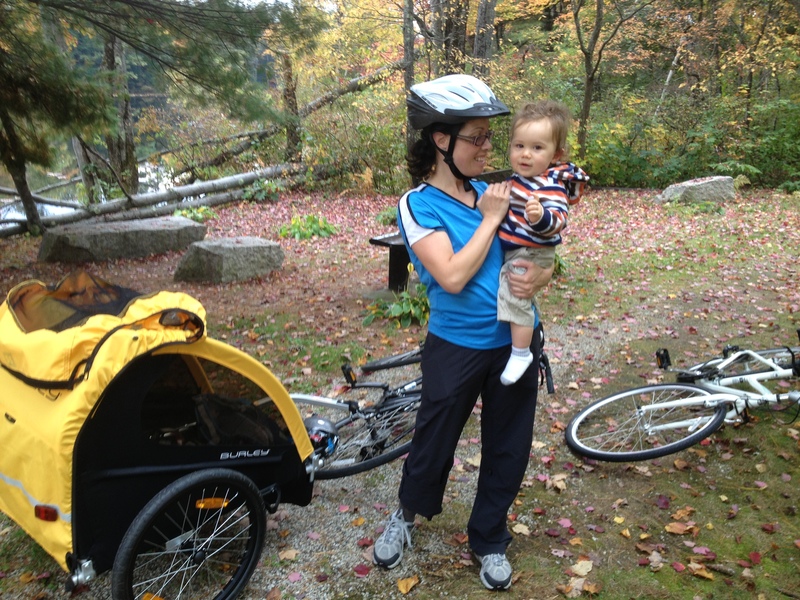 Yesterday we drove over the scenic Kancamagus Highway to Lincoln, NH to ride the Franconia Notch Bike Path. This notch has long been one of my favorite places in New Hampshire and is easily one of the most naturally impressive areas of the White Mountains. I have childhood memories of trips to see the Old Man’s profile, swimming in Echo Lake, learning to ski on Cannon’s steep and icy trails, and later in life learning to rock climb on the biggest cliff in New England along with learning to bail off scary ice climbs in the middle of snowstorms… suffice it to say visiting this notch always stirs up some great memories. A new memory was created yesterday, and while it will be cherished, it certainly wasn’t as ideal as I had hoped. Then something strange happened. From back in the bike trailer came a cry… then a scream. We stopped to investigate. Were the straps pinching? Let’s adjust his clothes to give him more padding. Let’s try this again. 5 minutes later screaming again, stopped again. What’s wrong buddy? Out of the trailer, holding, soothing, calming down, look at the water… throw some sticks in the river… no more tears… Ready to get back in? “no… no… no… NOOOOOO!” reminded me of his first hiking trail meltdown…. “He just hasn’t had a nap yet” I tell my wife, lets just bear it for 10 minutes and he’ll fall asleep. 10 minutes later the screams reach a crescendo and I pull over again. This time it’s a 20 minute stop, and we’re discussing turning around. We’ve only gone 3.81 miles on the 17 mile round trip trail… I’m convinced our attempt is through and Michelle catches me by surprise when suggesting we continue as he is momentarily OK being in the trailer. 5 minutes of riding in silence… I savor every rotation of my pedals praying he’s falling asleep. If he falls asleep he should be out for at least 2 hours, long enough to complete the whole ride. We go over a bridge. He’s screaming again. We push on. I wish I could say he fell asleep and we enjoyed our ride. The truth is I spent most of the ascent wondering if I should turn around. That’s not a great way to enjoy any trip. I was certain if we turned around he’d be asleep in 10 minutes anyways so why not push on? The temperature was perfect, he was dressed well for the weather, he had food & water with him in the trailer… so what was bothering him so much? I can’t wait till he is just a little bit older and able to say “Daddy this is what I don’t like”. Michelle thinks it may have been the wind at speed (20 mph on the downhill), but lowering the wind-shield on the trailer did not resolve it. She also thought it may have been to much of a jostle when I hit small bumps on the paved road. I was reluctant to think this could be the cause as the road is quite smooth with rare little bumps, but I’m resolved to cut up some closed cell foam and try to add a bit more comfort in the cockpit for the kiddo. We reached the northern end in just under 2 hours. 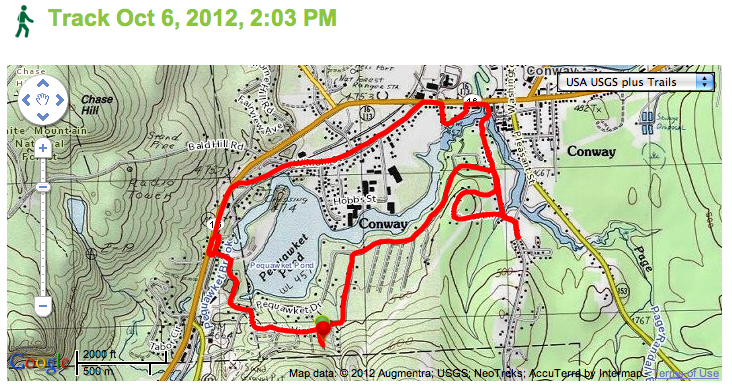 Of course this was truly only half-way, since it is not a loop trail. It’s definitely a climb though! I count 6 stops in the first hour & a half! Only 1 real quick stop on the ride back down the notch, right before the parking lot. Towards the end I was desperate to get the kiddo out of the trailer but also get back to the car… he clearly had not enjoyed this ride through the Notch. We noticed one other couple with a bike trailer with 2 slightly older kids inside. They, my wife pointed out, had books to read which seemed to keep them happy. Great idea! So I’ll be adding some custom closed cell foam to the trailer this week which will also let me ride with Alex later in the season as it will be warmer. And books for the road are now on the gear list. I’m hoping this was just an isolated dislike of the bike trailer, but we will see! Oh, did I mention he just turned 2 last week? We have plans to go apple picking, maybe hit the Fryeburg Fair, the Sherman Farms corn maze, some more hikes, and maybe, just maybe, a bike ride (we’ll see). I’m also attempting to commit to blogging once a week, probably Sunday’s, so if you are interested in more consistent trip reports, gear reviews, etc, please subscribe so I know folks are reading. Also, how are you enjoying this Fall with your kids? Please leave a comment below about this post or what you love to do with your kids during this awesome time of year, and thanks for reading! 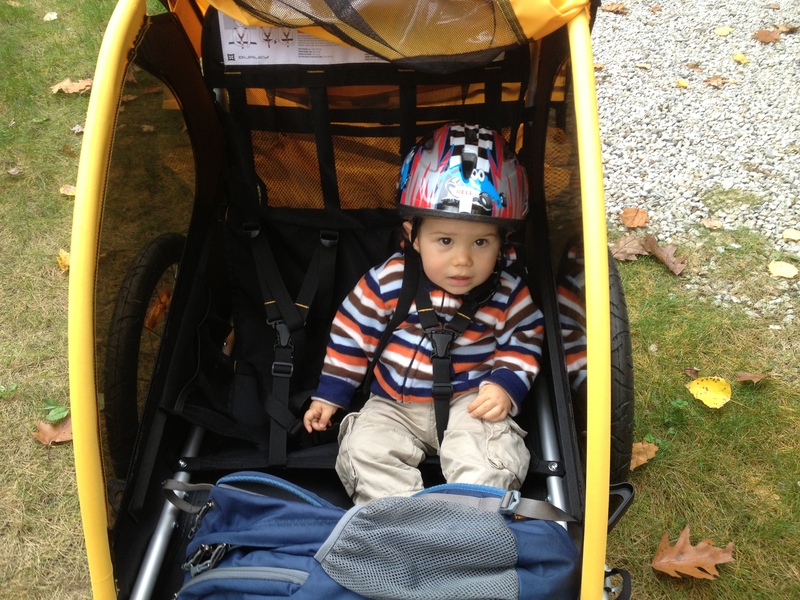 At 19 months Alex is the perfect age to spend some time in our Burley Bee Bike trailer. He enjoyed a 12 mile ride last week when I used it to run some errands in town, so today I decided to check out the recently opened Fryeburg section of the Maine Mountain Division Trail. This northern section is a nicely paved 4.2 miles with some scenic bogs and fields. The non-profit Mountain Division Alliance’s long term goal is to have this trail opened all the way to Portland, ME, about 50 miles! After collapsing the trailer and tossing it in the back of the Matrix (it fits without putting any seats down), I loaded my bike onto our Thule Raceway, and off we drove to the Maine Visitor center just over the NH/ME line on Route 113 where the trail starts. Lots of folks were out pushing strollers, jogging, or riding enjoying the perfect early Spring weather. It’s definitely a cruiser of a ride with very minor hills and no sharp turns. We reached the end about 25 minutes from starting and stopped for so Alex could get out and explore. Most people I’ve hiked with know I prefer loop trips whenever possible. I dislike returning the same way I came if I can help it, and a quick look at the map showed returning via 113 would provide that loop, and let us ride through scenic Fryeburg village. So we did, the 8.49 mi. round-trip took 55 minutes, average speed 9.4 mph, max speed of 20 mph. On the return trip Alex got a bit cranky and I couldn’t figure out if he was a bit to warm with the windshield down, or too cold with the windshield up, or just didn’t want to be strapped in at the moment (leaning towards that). He was all smiles by the time we got back to the car, and after meeting up with Mommy in town for some lunch and a stop at the playground he was out. I’m excited to put a lot of miles on the bikes this summer. I’ll be posting a detailed review of the bike trailer, our bikes, our bike rack, helmets, etc in the coming week or two and will link them where appropriate in this post. If interested you can follow this blog just by clicking “Follow” down on the right hand side of the page. Thanks for reading, see you on the trail! This past May Michelle and I bought a couple Marin Seadrift hybrid bikes and while I got to put some miles on mine during the Five Borough Bike Tour Michelle had yet to get on her’s… until today! Despite only having a month or two of decent biking weather left we decided it was time to pony up and invest in a bike trailer so we could get out as a family and spin some wheels. 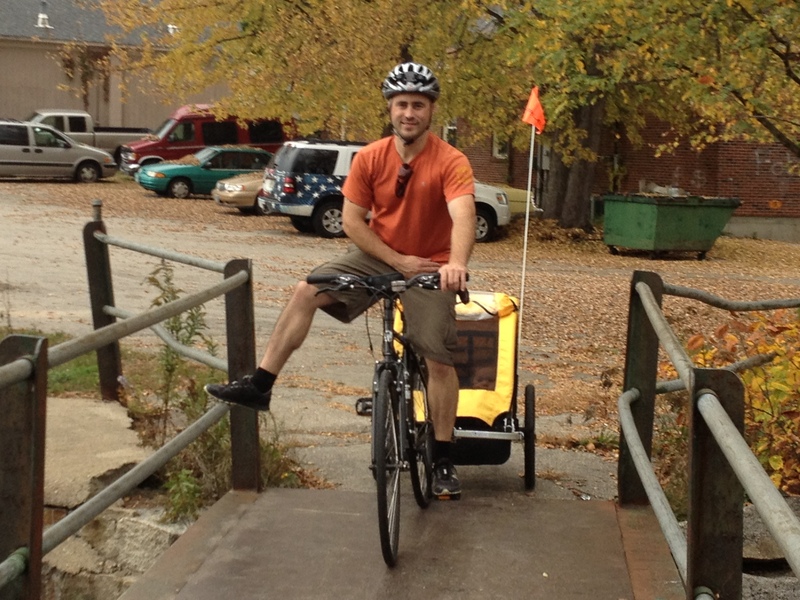 After considerable research we decided on the affordable Burley Bee Bike Trailer, and after grabbing the last one at a busy EMS North Conway we hurried home to grab our bikes and get some miles in while the weather was nice. Are you sure about this Dad? Since this was a floor model it was all assembled, but looking over the directions it didn’t appear to be that hard to put together. It only took about 5 minutes to attach the hitch to the bike and then to the trailer. I thought it was pretty clever how it attached right to the rear wheel axle of my bike and the pivoting mechanism allowed the bike to be laid down while keeping the trailer upright. This is not only a convenience feature, but a safety one because the trailer would be less likely to tip if I were to take a small spill. The harness system was straight forward enough, but it definitely lacked the padding and comfort features of the more expensive models. We placed our diaper bag/backpack in the space in front of his feet so he could push down and keep himself in a more upright position. Without it Alex was a bit slouched. Once he grows a half foot taller he’ll probably be more comfortable in the cabin. The back has a spacious “trunk”, which we’ll be using for grocery store trips in the near future. We decided on a mellow loop out to Route 16, through Conway Village, and back home. The first thing I noticed was how not noticeable the trailer was. Going down hill, or on flat ground, I simply could not tell I was pulling a 23 pound kid in a 20 pound trailer. It makes sense, since the thing is on wheels… but I was surprised none-the-less. Our dirt road is a little bumpy, and while Alex was jostled around a little bit we took it slow until we got out to the paved Route 16. Here the traffic was crawling along at a snails pace with a combination of leaf peepers, Freyburg Fair go’ers, weekend vacationers, and a few frustrated locals. We pulled off onto the historic West Main St and enjoyed the quieter back-way into the Village. After following a dirt foot path along the water for a short bit Alex let us know he wanted to get out for a minute so we took a short break behind the Conway Fire Station. As we neared our neighborhood we decided to add a short loop over Jack Frost Lane and we stopped by a farm stand on Tasker Hill Rd to see their selection. It wasn’t until we were climbing back up our road that I started to notice the extra weight I was pulling, but it was a short climb and minutes later I was glad for it as I enjoy a quick pump at the end of a work-out. Our 5.26mi loop took just under an hour. The bike trailer performed better than expected and we’re already thinking of where we should ride tomorrow!